The Pella Police Department has seventeen full-time officers, five reserve officers, and seven civilian employees who provide public safety services to the citizens of Pella. View the department directory. 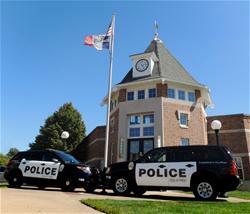 Committed to providing the citizens of Pella a safe place, the Police Department provides coverage complete with public safety answering point dispatching for a 10-mile radius of Pella, including enhanced 9-1-1 services. The communications center also dispatches fire and ambulance services. The department uses bicycle, motorcycle, foot, and vehicle patrols to provide public safety services. Participating in several grant opportunities from such entities as the Department of Homeland Security and the Governor's Traffic Safety Bureau, the department has been the recipient of monies to enhance their equipment. The purpose of the Citizens Police Academy is to foster a strong and lasting relationship between the Police Department and the community by allowing citizens to experience the training and occupational rigors shared by law enforcement professionals. Anyone interested in the academy is encouraged to contact Lt. Paul Haase or Officer Shawn Veenstra. Completed Citizens Police Academy Applications should be dropped off at the Police Station. If I lose my pet, what should I do?